If you are shocked by the way college students are embracing socialism, you haven’t been paying attention for a few decades. Of course, this is a result of many factors, but one that is less frequently discussed is that few of us focus on economic education even when taking responsibility for our own children’s education. After all, when was the last time you discussed inflation with your seven-year-old? Talked about competition and market regulation with your pre-teen? Fortunately, the Tuttle twins have stepped into this void. 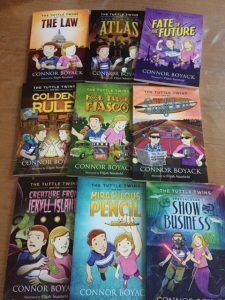 A series of entertaining books featuring the fictional twins present complex ideas with clarity and simplicity. Whether the twins are running a lemonade stand, enjoying themselves at camp or hanging out with neighbors and classmates, basic societal and economic principles intertwine with their lives. I have frequently undertaken the job of warning you to beware of books that might undermine your family values. Often, the agenda in the books is hidden. If you don’t pre-read them, you will probably never know about the message on p. 63. In contrast, these books openly have an agenda: a defense of what my husband calls ethical capitalism. The author, Connor Boyack and illustrator, Elijah Stanfield, take concepts from thinkers, economists and authors such as Henry Hazlitt, Ayn Rand and Frederic Bastiat, and turn them into appealing and informative stories. Judging by my test panel’s response, ranging in age from eight to fourteen, children will enjoy reading these books, which would be a worthwhile result in itself. Even better would be if parents and older children read them as well, sparking an opportunity for family conversation and for more advanced reading for the older group. As parents, we ideally have more than four years to inoculate our children against the harmful ideas and mistaken beliefs that will bombard them. I heartily recommend that you add this series to your tool kit. I have written quite a bit lately about the children’s books I’ve been reading, appalled at how much of an agenda they contain. An article by Dave Seminera in the December 16, 2018 Wall Street Journal reminded me of another point. I don’t know who chose the title for his opinion piece, but it is most apt. Reading from Left to Left points out that even if books are individually unoffensive, or even exemplary, the thrust of what is available leans heavily in one direction. Recently, certain adult news magazines ostensibly writing about women candidates in this fall’s election, highlighted only Democrat women, ignoring or downplaying those running on the Republican side. Mr. Seminera notes a similar philo-Left trend in the books chosen for display and attention at his Barnes & Noble. Hoop skirts and petticoats went out of style before my time as did butter churns. Nonetheless, I am two generations closer to a time when those items were in general use than my grandchildren are. And while I love sharing classic books with the young ones in my life, I also look out for writing situated in current times. With this in mind, I was delighted to meet the fictional protagonist Cilla Lee-Jenkins, a spunky and funny eight-year-old aspiring author. Like the author, Susan Tan, Cilla’s family is composed of both “white-bread” American and Chinese immigrant grandparents. The first two books in what may well become a long-running series were almost entirely a pleasure to read. (There is a third book I have not yet read.) Aye, there’s the rub. In the second book, Cilla Lee-Jenkins: This Book Is a Classic, Cilla’s aunt gets married, providing a pleasurable peek into both Chinese and Korean wedding customs. The sour note comes as Cilla’s aunt’s friend, Jane, is introduced along with her own girlfriend and soon-to-be spouse, Lucy. Sigh. Psst! Want the Secret to a Great Education? When I was actively homeschooling, I would occasionally see humorous lists citing the top reasons to homeschool. One that resonated with me (and seemed serious to me even if it lent itself to funny illustrations) was that homeschooling validated hours upon hours of reading. Not only did I get to read in order to prepare for teaching, but there was a practical need for reading books about education and learning. With that in mind, those of you in the trenches of parenting whether you are homeschooling or not, might enjoy reading two books that I recently finished. Lenora Chu is an America journalist whose parents immigrated to the States from China. When she and her small town, Minnesota-bred, blond and blue-eyed husband attain career opportunities in China, she utilizes her skills to explore and compare education in China and her home country. Since the couple has two young children, one of whom they enroll in school, her writing is conflicted, passionate and very human. Little Soldiers: An American Boy, a Chinese School and the Global Race to Achieve is a fun read that will make you think. Like Ms. Chu, you may find yourself alternately horrified, envious, curious and forced to analyze exactly what your goals for education are. Most book titles mean something only if you are familiar with the contents of the book. There is nothing particularly descriptive about the words, Little Women or Tom Sawyer. The titles evoke a reaction only because the books are well known. More intriguing names like The Red Badge of Courage or The Scarlet Letter are also only meaningful after reading the book. Even a short plot synopsis doesn’t automatically let you know that this book will be one of those that becomes a classic and which you might find yourself reading over and over. Four sisters during the Civil War years go about their daily lives, maturing from girlhood to womanhood. Not terribly gripping, is it? The above doesn’t apply to one of my favorite reads, I Didn’t Plan to be a Witch. This mother’s lament at not always measuring up to her image of what she should be, grabbed me at the title. The author, Linda Eyre, had previously written a best-selling book with her husband, Teaching Your Children Values, which evolved into a series of books like Teaching Your Children Joy, etc. That information was enough for me to know that this book wasn’t going to be sordid tale of drugs or promiscuity. Indeed, I Didn’t Plan to be a Witch echoed my internal cry when I didn’t live up to my own standards. I enjoyed the book, but the title stayed my favorite part through the years. Just looking at it on the shelf could make me laugh and buoy my spirits especially on those days that I felt like a failure. The book still fills that purpose for one of my daughters who has “borrowed” it, finding it reassuring after a disappointing day. When looking for books for my children, I used to peruse the Newbery Honor books (and, yes, until I started writing this piece, I thought it was Newberry). Since I care about morals as well as language, I admit to favoring books that were chosen for the award in earlier decades. With that in mind, I am delighted to recommend a recent honoree, The War that Saved My Life by Kimberly Brubaker Bradley. This book and its sequel, The War I Finally Won, tell the story of Ada, a ten-year-old British evacuee from London during World War II. I appreciated the depiction of England during wartime including rationing, bombing, the death of so many soldiers and the real fear of invasion. But the story is deeper than a historical fiction sketch of England in the 1930s and 1940s. In addition to what I recently wrote, Sarah Mackenzie makes another important point in her book, The Read-Aloud Family. When we read to older children we expand their vocabulary. While a child might get frustrated reading a book too much above his or her comfortable reading level, children begin to decipher unfamiliar words in context when a parent is reading. Even when a child is reading at an advanced level, reading aloud has an added benefit. I think every homeschool parent of committed readers has been amused when their children mispronounce words that they have only met through printed matter. Reading aloud gives children a chance to hear new vocabulary words as well as see them. Superman comic books may not generally be considered advanced literary material, but the childhood hours I spent reading them did help me do well on my SATs. While I didn’t read the comics for vocabulary lessons, years later the spurious documents that one criminal used served me admirably when I needed to pick the correct multiple choice synonym for that word.